This symposium was motivated by a concern perceived by both resource professionals and lay public alike that sugar pine as a species might be in imminent jeopardy from the introduced disease white pine blister rust. Even though the rust had been on the attack for over half a century an attitude of complacency prevailed. It was thought that the epidemic had stabilized and in many areas of the species' range the problem would not be serious. In the mid- and late 1980s, however, heavy infection suddenly began to appear where it had never been seen before in parts of the central Sierra Nevada on sugar pine, and also at high elevations on western white and even whitebark pines. The effects were especially lethal on regeneration, both natural and artificial. What was happening? Did this mean that sugar pine was in greater danger than had been imagined all along? Were management tools and concepts adequate to meet the challenge? There was concern that no one knew the magnitude of the crisis, or what to do about it. 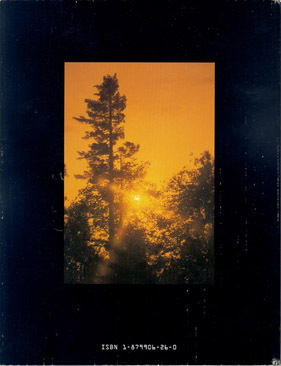 The California Sugar Pine Management Committee, a diverse ad hoc group composed of land managers, researchers, academics, conservationists, and others, met in 1989 to discuss the situation. It was soon recognized that blister rust was not the only problem facing sugar pine, and that much of what was known about the biology of the species was in scattered reports, filed data, and individuals' memories. 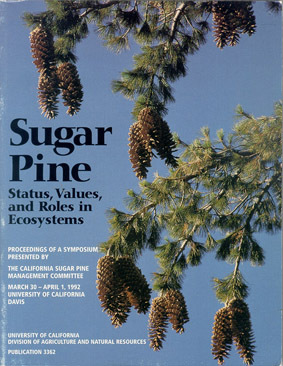 There was an evident need to gather under one cover the most current and scientifically valid information available on the status, value, and roles of sugar pine in ecosystems, to serve as a guide for setting policy, management strategy, and research direction. The Symposium and these Proceedings were logical consequences of this reasoning. Anyone who probes these pages more than casually will soon recognize how limited the current knowledge base is. Nonetheless, we hope that the information provided here will expose critical gaps in knowledge as well as provide a baseline upon which to build, and thus serve as an invaluable resource for those interested in the study, management, and conservation of sugar pine. Jones and Stokes Associates, Inc.
1 Is a Little Knowledge a Good Thing? 133 Variation in Virulence in Gronartium ribicola: What Is the Threat? Abul K.M. Ekramoddoullah and Bolvin B. Kinloch, Jr.